Ellie and her team managed the workshop so well that never were we without a tool that we needed or an ingredient. Or Suvir without his Coke! The Escoffier Home Cook Kitchen is like well-oiled machinery, working together cohesively toward a common goal. The excitement started well before the workshop actually began—at the airport, in fact. I drove Ammini through a tornado! It was rather bizarre as I have never been in any kind of tornadic activity before. But according to many of Suvir's friends, that was just a precursor to the real storm that awaited us! "Oh, that Suvir!" Asha seems to be saying. The real tornado unleashed itself on us later that morning in the form of Suvir, who is like Passion & Charm Central, which softens his sometimes hard-hitting, irreverent humor. 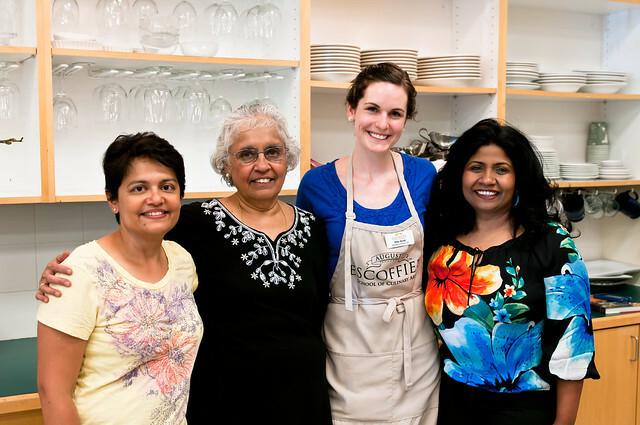 From this group of chefs and instructors, only Ammini and Suvir had ever taught or cooked together. I was meeting Ammini, Asha and Suvir for the first time, having had the longest relationship with Ammini online—over 7 years. Yet it was rather amazing how well we all worked together, bouncing off each other, assisting each other, even disagreeing with each other thereby highlighting regional differences. There was no ego. 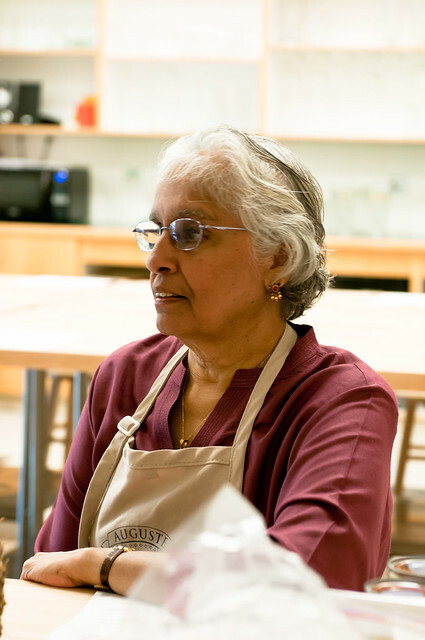 There was just one goal: teaching homestyle Indian food, made richer by stories and traditions, not heavy cream and grease. Our participants made this workshop even more enjoyable. There was a young man who drove all the way from Montana for this class! My friend Lee cut short her vacation to attend! A casual yet structured workshop allowed for a lot of interaction between the participants and the instructors. Clearly, this audience was engaged! Despite being jet-lagged and unwell, Suvir came through! It was two days of learning, for the participants as well as us. Asha made her first ever roti and watched it puff up magically on the flame! Ammini taught us all about the benefits of coconut oil. As for Suvir? He just stood there oozing charm. Of course, I'm kidding! 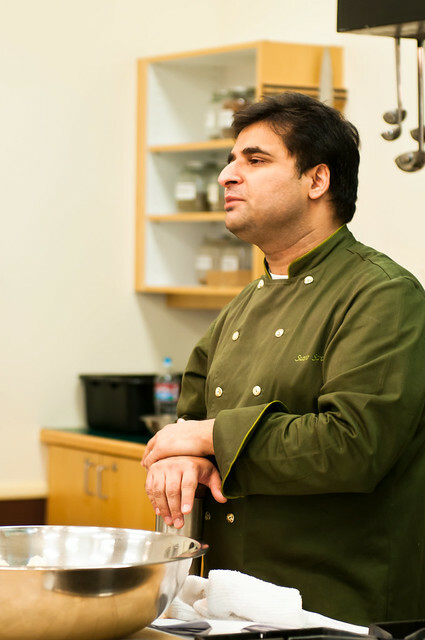 Once in the kitchen, Suvir's mastery over his trade is very obvious and he moves with great confidence, directing when needed and assisting when required. I had to get a picture with these three exceptional women! These last two days completely changed my perception of Indian food. Thank you! I used to be intimidated about cooking Indian food at home. This, I think I can do! That, by itself, made the months of hard work worthwhile. 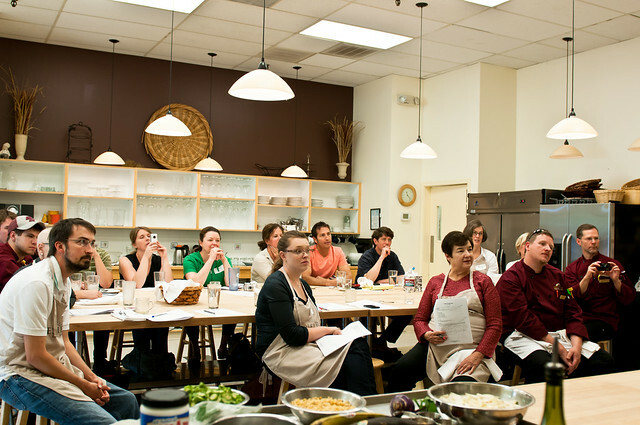 This workshop is just the beginning of taking homestyle Indian food to a wider audience. 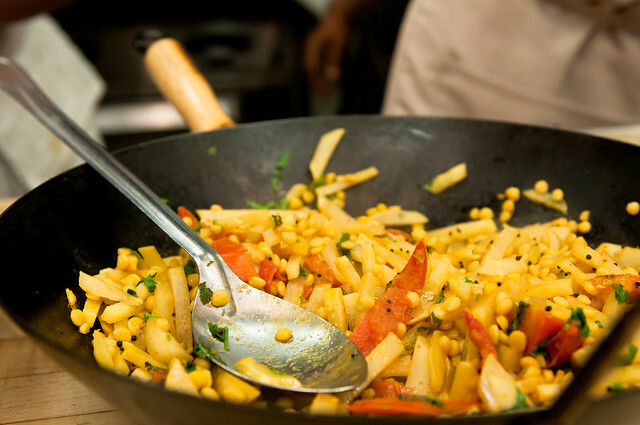 The regional breadth of Indian cuisine makes it the most versatile cuisine, whatever one's dietary preference, from gluten-free to vegetarian to an omnivore's diet. This is the only picture I have of the four of us. 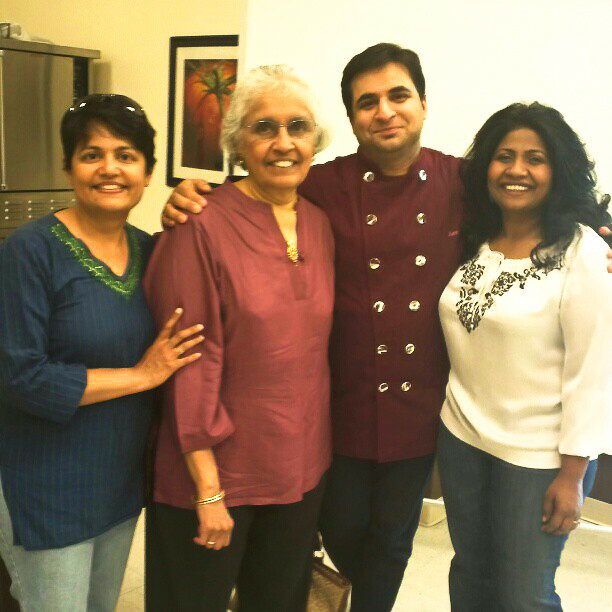 If you attended the workshop and have a picture of all four of us, I would love it if you could send me a copy by email: indianfoodrocks at gmail dot com. 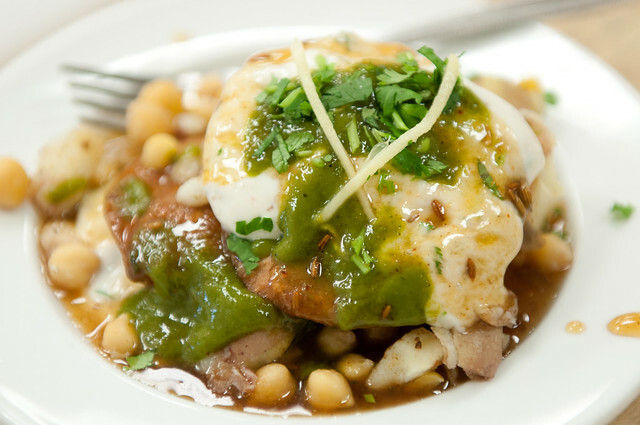 Allan Parr is writing a three-part review of Culinary India, the first of which is already available on Eat Drink Boulder. 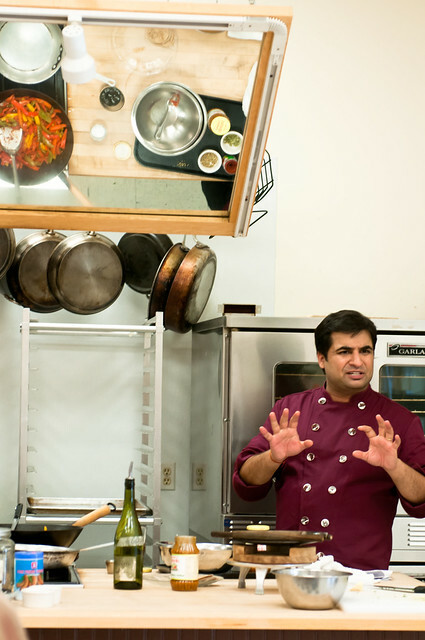 Part 2 will focus on Escoffier's Home Cook School and in Part 3, Allan will share recipes from Culinary India. I have more pictures in my Culinary India set on Flickr or if you prefer Facebook, the same pictures are in an album here. Looks like a lot of fun, and good food!! I have a question about the last blog recipe (Ammini's Lemon Rice): it calls for "cleaned urad and chana dal". Does this mean dry, presoaked, or what? I'm afraid that if I fry the dry dal it will be unpleasant and hard. The food looks wonderful and so homely, especially since I have made Ammini's vendakka Kiichadi from your blog, I can imagine what it would be like. Every thing looks so perfectly organised and the kitchen is to die for. 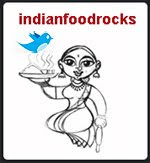 I haven't seen a single place with mirror to view what's cooking in the pots here in India., not even on TV shows! Superb show Manisha and team! 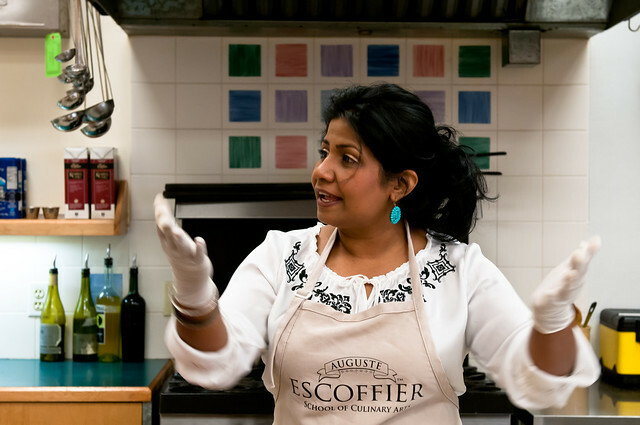 Manisha, I liked the Kelsey Nixon point..perhaps even G Fieri and a host of others! It looks like you had a wonderful time-Ammini looks gracious as ever! Bombay-Bruxelles, thank you, again! And yes, we did! Now, we need to make a plan to get you state-side! Anna, my apologies! I missed replying to your question earlier. By cleaned, it means picked over to ensure there is no debris. I use dry dals, directly in the hot oil. They become deliciously crunchy and then absorb the flavors in the oil. Don't burn them or fry them too long as that is what will make them unpleasant. We add dals to seasoned oil in raitas and veggie sides, too. For example, this eggplant talasani. If the dish has a sauce, the dals soften. They add a lovely texture to the lemon rice. Try it! Anjali, it was a treat to eat okra kichadi made by Ammini. It told me many things: that I was doing it right and not only are her recipes well-written, they are also well tested. Ammini is in a class by herself! So much to learn from her! Escoffier's Home Cook Kitchen is currently under renovation so I can't wait to see what it will look like. But what you see in the pictures is also a fine kitchen. It was built in the late 90's! It is bright and very cheerful. 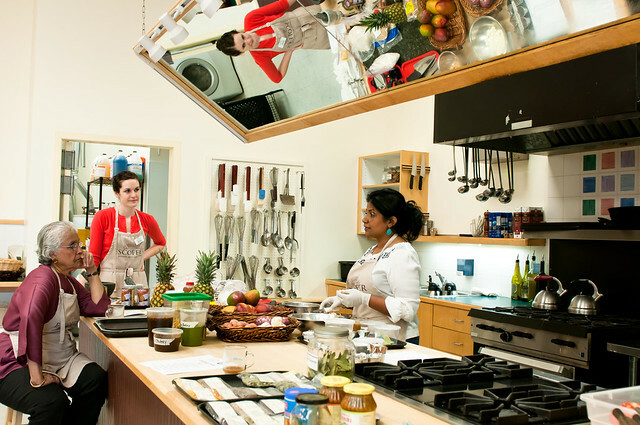 Most cooking schools have mirrors. Even little demo carts have mirrors. I'm not sure that TV shows need to have mirrors, unless there's a fairly large studio audience present. And, thank you, for being one of my biggest cheerleaders! Hugs! Shri, thank you! Ammini is so accomplished yet very humble. I want to be like her! I don't watch much food TV as I cannot handle the waste or the disrespect that is accorded to food. It is no longer about nourishment. I did seek out Kelsey Nixon's Indian Perfect 3 on Comcast's OnDemand as my friend Nivedita of Panfusine was making her carrot halwa blondies on that show. Thanks, Manisha! I must try the lemon rice recipe now...I love rice in all its forms and this one looks like a keeper!! You are a lucky woman to have enjoyed Ammini's cooking and company. It's my pleasure, you always get me so excited and curious about the things you do. Hugs right back to you too. Manisha, I would have LOVED to come but with a trip to Oregon just around the corner, and an unusually busy summer, it just couldn't happen. I hope you can do it again. By the way, Justin was using my computer, so just so you know, that was me, Peggy, who left that comment! haha! Brilliant Manisha, thanks for the pics and the report. Seems like this was quite an event! 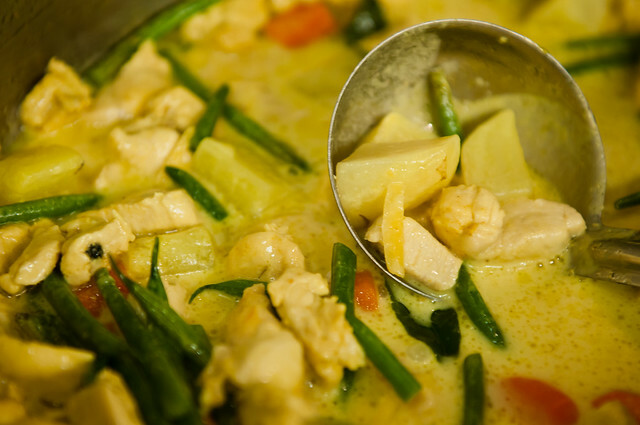 Congratulations on a job well done - in presenting well, and taking some of the exoticism out of Indian home cooking. Kudos to the entire team. If you look at Dalvinder (an Aussie-Indian) cooking on MasterChef Aussie, you might be forgiven to think that curry is the beginning and end of "Indian" cooking. The less said about the roti shown on that show, the better. Which is not to say that there are no good food programs. The ones I tend yo watch illustrate the beauty of quick-no waste, everyday home cooking. Congrats Manisha for such a lovely workshop. The intent look on the participant's face says it all. How I wish I could have been there. Hearty congratulations! Dear Manisha , was very pleased to receive such a happy and food-centred story and photos . i was dreading the next communication from you , due to the terrible bushfire stories we were getting about Colorado , here in Australia . great ! cheers ! jk. Congratulations! I bet it was so much fun. Do you plan to have one in Texas, any time soon? Would love for you to. Manisha, you were right (which of course you knew). The toasted dals worked beautifully in the lemon rice. The recipes you post always work, even if I don't have all the ingredients (like no curry leaves here). I guess since I don't know what they taste like I don't miss them. But the recipes are always delicious and seem fail-safe. the knife thank you for being open to both sides of the coin! anna, I am so thrilled that you made my lime pickle! It's a bright and cheery pickle! I am also happy that you liked the idea of toasted dals! 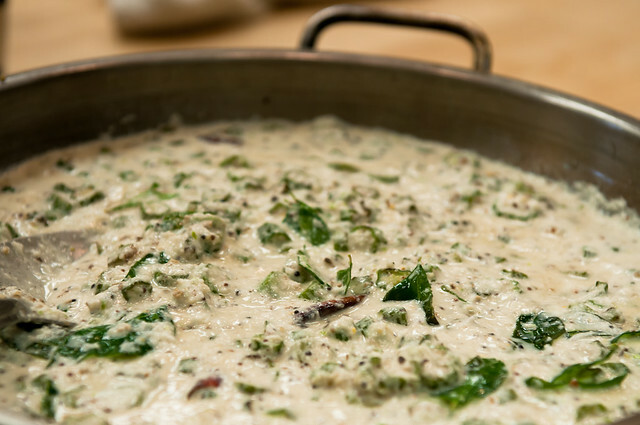 I am guilty of a little extra dal just for me ;-D I wish I could send you fresh curry leaves. They have a lemony-citrusy fragrance. Don't ever buy dried curry leaves or frozen ones. It's better to do without. Have you checked with your Indian grocer if he has a plant or knows where to get a sapling? That way, you could grow your own. They do well in pots even though it's really a tree. Anjali, red checks forever! Hugs! Peggy, it would have been a treat to have you at the workshop. I hope we can do it again, too. I will let you know when we do! BF, it was! Thank you! Anita, thank you! And thank you for being such a great friend! I've pretty much stopped watching any food channels. The only show I miss is Alton Brown's Good Eats with its practical approach to food, including explaining all the chemical reactions that occur in the process of cooking. BM, thanks! I think they had a good time! Cynthia, I would have been on cloud nine if you had been there, too! Thank you! John, part of the reason I was so quiet was the wildfires. There were three within a 100 mile radius. The increased particles in the air due to the smoke took its toll on me and I suffered but it was minor in the face of what those who lost their homes went through. The general distress in the air made me feel inadequate. Luckily all these fires are now 100% contained! Good to hear from you, as always! Sihi,thank you! I would love to do a workshop in Texas! Who knows, we might in the future! congrats Manisha on the great workshop! Such a great combination (of people and food) and lovely glimpse of the dishes you cooked.